Easy Gourmet Recipes - Lemon Applesauce Pudding Recipe. Healthy natural recipes including breakfast recipes, appetizer recipes, soup recipes, pasta recipes, holiday recipes, party recipes, dessert recipes, gluten-free recipes, raw recipes and budget recipes. 1. Add applesauce and 1� cups of juice (or cider) to a medium pot and bring to a boil. 2. While the applesauce is cooking, take the remaining � cup of juice (or cider) and stir in the arrowroot powder until it has completely dissolved. 3. Once the applesauce is boiling, add the cider with the dissolved arrowroot powder. Cook until the mixture is clear. (This should take about 10 minutes). 4. Add vanilla and lemon rind, and cook for another 5 minutes. Remove from heat. 5. 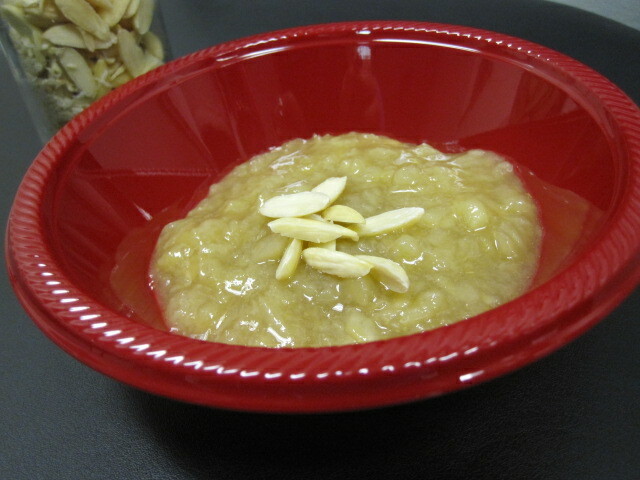 Plate indivicually and top with chopped almonds. May be served warm or chilled.